On the Catalina 32, attention to details like the custom molded galley counters with integral backsplashes, halogen lighting, and a cedar paneled hanging locker, set the 320 apart from the ordinary. The engine installation is fully accessible by removing the fore and aft insulated covers. 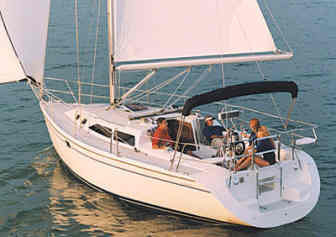 The Catalina 32 has two private double cabins, one forward and one aft. The forward cabin is a V-berth formation. The salon settee converts to form two more berths on the starboard side and a single on port, if necessary. As there is only one head with hot and cold shower, we ideally recommend four people for a comfortable charter.